Day 145: How Does the Sun Rotate? 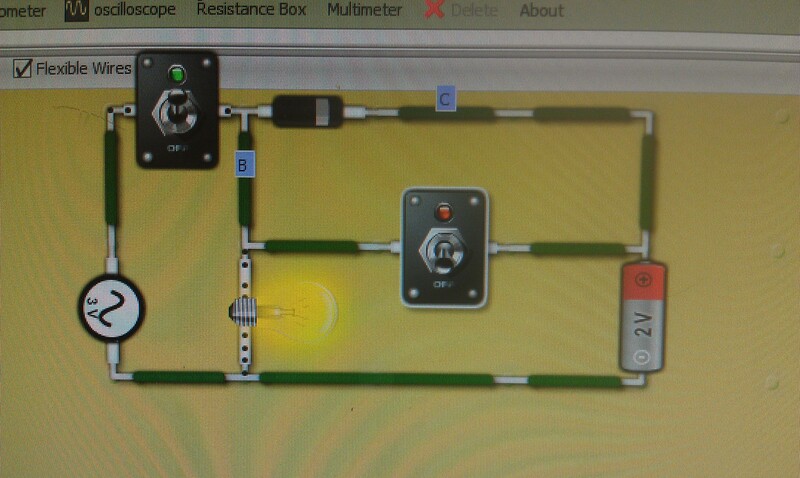 Conceptual Physics: Students used the PhET circuit simulation to explore how current and voltage behave differently in series and parallel circuits. AP Physics C: Practice AP free response questions on Faraday’s Law. Day 141: How Big is the Sun? College-Prep Physics: It was sunny out today! 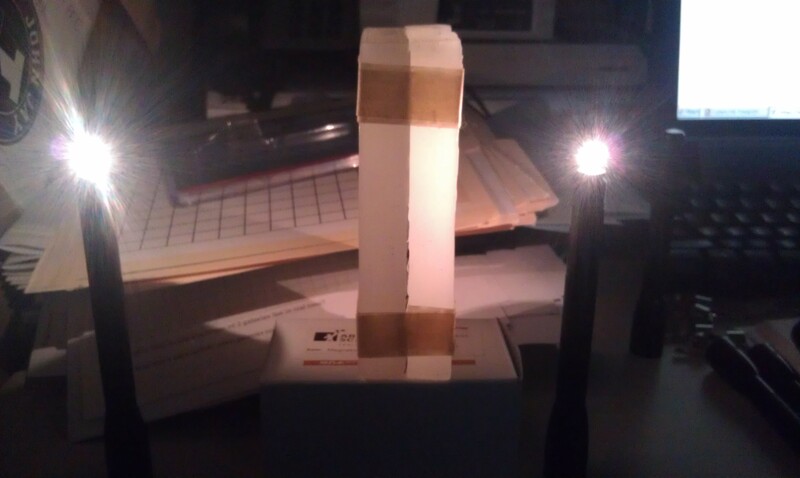 So we poked a hole in the side of a copy paper box to make a pinhole camera. Aimed our cameras at the sun and measured the resulting image in order to determine the true size of the sun. 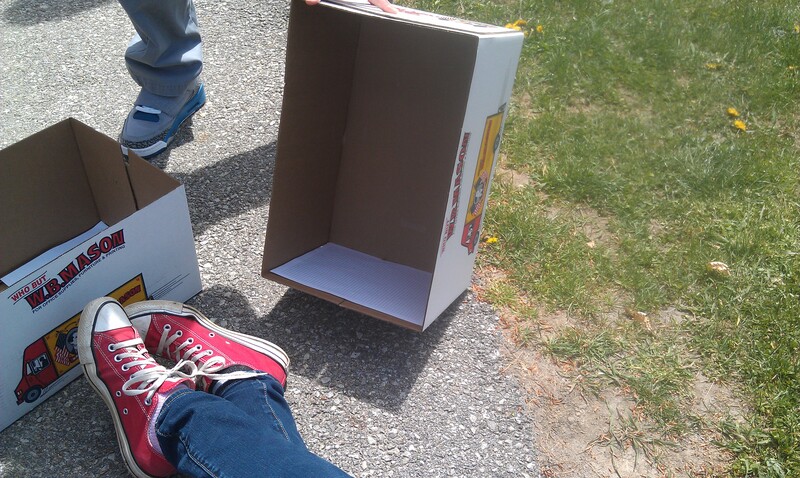 The copy paper box worked beautifully: the sides with the hole and the screen are always parallel; it’s easy to aim the camera directly at the sun — lay box on ground and lift up/turn until box shadow is square; for the size of the box, the image of the sun is exactly 1/2 cm across (so it fits perfectly within 1/2 cm graph paper). 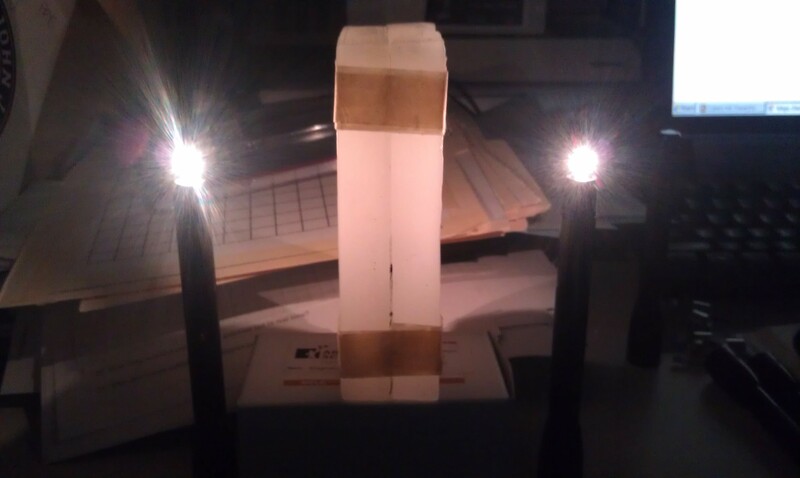 We didn’t do anything fancy with foil like I’ve seen for other pinhole cameras on the internet. Should we have? Why? 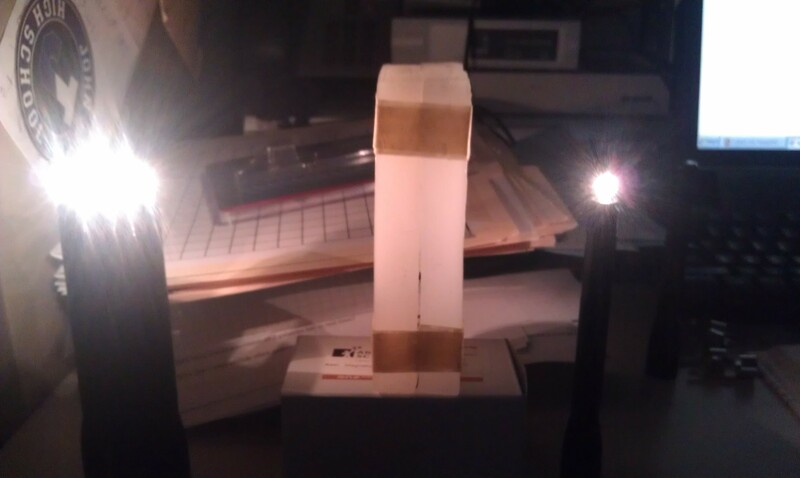 Conceptual Physics: Students finished the diode circuit simulation activity from yesterday. One group came up with a possible bike generator circuit that will charge the battery and light the bulb while pedaling, and will also use the battery to light the bulb when the pedaling stops. Day 139: How Bright is the Sun? What was amazing was that a student then asked, “Could we do this comparison with the sun?” … which is exactly what I had planned 🙂 . Groups of students took turns going outside and repeating the experiment with the wax phototometer and a 200 watt bulb in order to calculate how many 200 watt lightbulbs would be as bright as the sun (first picture). Conceptual Physics: Students began drafting possible circuit designs to modify the bike light generator so that: 1) a battery lights the bulb when the rider is not pedaling and 2) that battery gets recharged while the rider is pedaling.